My father-in-law told me about this gal, Kristie Sheanshang, who started her own styling/personal shopping company called “Flair.” She used to be in the banking industry, which is where he met her, but she recently broke out on her own to start Flair. Time to switch out your Closet & to add some Flair! Aren’t you tired of looking at all those pastel colored summer clothes? Aren’t you ready for more structured materials, more tactile fabrics in richer colors? Of the pieces that are ready to be packed up, organize them for quick access if an impromptu trip or costume party arises. Fold, place in large plastic bin with an indicator label and store them in a clean, dry place. A word on Bugs – they are most attracted to natural fibers such as wool, down, cashmere, mohair and silk. Hungry insects will eat synthetics if they’re seasoned with food spills, stains or perspiration. Dry cleaning or washing in hot water will kill pests in all stages. Even more reason to clean clothing carefully before storing it. Here’s a tip – Add dryer sheets to each storage bin. Place them between the layers, as well as one on top. They will help the clothes smell fresh instead of stale, and provide a much better scent than mothballs! Short of Space – Why not store in an unused suitcase? You might as well take advantage of the empty space. Or what about a comforter or mattress pad bag? These are great for clothes, linens or baby clothes. A lesser alternative is cloth garment bags. They will ward off dust and wrinkles, but they aren’t airtight enough to contain insect-repellent vapors. Do Not Use plastic or dry cleaner bags! 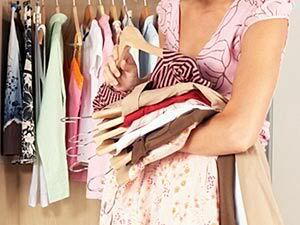 You risk discoloring and permanently damaging your clothes by storing them in plastic. Lastly, cardboard boxes are easily ruined by moisture, bugs and/or mice, so plastic bins with tight seal are your best option. · “Are my clothes safe hanging in a cedar closet?” Yes, the cedar oil discourages adult moths and roaches from entering and laying eggs, as well as preventing mildew. Cedar closets are safer than mothballs and provide a much better smell. It is a great place to store out-of season clothes. There are many DIY kits available to convert your current closet to cedar lined. · “Should shoes be stored in non-ventilated boxes?”Boxes or the soft cloth bags that come with higher end shoes are a sure fire way to prevent further scuffing and to keep the dust off shoes. See through boxes are preferred as you don’t have to guess what is inside. If using the box they came in, take pictures and tape to the outside. If you have shelves but not the depth for a box, my California Closet designer suggests putting a pair side by side, but the left shoe toe facing the back wall and the right shoe toe facing out. They take up the least space this way. Whichever approach you pick, an easy organizational trick is to arrange shoes by use (i.e. : flip flops, athletic, heels by height), then by color. Previous PostAlthea Update, Shows Love to Her Midwest RootsNext PostMeeting David Sedaris Tomorrow!